The Syrian military along with its Russian, Iranian, and Lebanese allies have retaken large swaths of occupied Syrian territory from Western-backed terrorists through the use of conventional weapons, including precision strike capabilities provided by Russian military aviation. Alleged chemical weapon attacks have been on such small scales as to have no tactical or strategic value to Damascus, but demonstrable political value to the United States, its regional partners, and the militants it has been arming and backing since the 2011 conflict began. Chemical Weapon Attacks: Cui Bono? The article claims that chemical weapons are a cheap alternative for struggling regimes fighting wars “on the cheap.” The article proposes that chemical weapons are ideal for terrorizing the population and to target “buried facilities” that a lack of precision munitions have left otherwise invulnerable. Chemical weapons have proved to be more psychologically damaging to populations than conventional munitions, and are thus well-suited to the regime’s strategy of mass punishment. Yet the article can only cite 4 instances in which the Syrian government allegedly even used chemical weapons in the past 5 years. There have literally been more total cities the Syrian military has had to retake from foreign-sponsored militants than even the most liberal number of alleged chemical weapon attacks blamed on Damascus. For Assad, chemical weapons also compensate for the limitations of his army’s older, less sophisticated weapons. While the use of precision-guided munitions has grown in militaries around the world, they are still a comparatively small part of most countries’ arsenals, limited to anti-tank roles or against naval targets. As a result, most states are forced to use unguided munitions instead. Many targets, if sufficiently protected, can weather most unguided attacks by sheltering in structures, tunnels, or fighting positions. The article claims that chemical weapons can seep into these heavily defended positions “with relative ease.” However – again – the article itself can only cite 4 instances where Damascus allegedly used chemical weapons in the past 5 years. Syrian forces have obviously encountered well-fortified militant positions more than 4 times in the past 5 years – having retaken buildings, blocks, districts, and even entire cities through the use of conventional weapons and military tactics. The routine use of humanitarian corridors, cease-fire deals, and the government-sponsored relocation of militants lays to rest the West’s claims that Damascus aims to “collectively punish” its own population. The Western narrative falls apart even further when considering the Syrian government most certainly does have access to precision munitions and the ability to deliver them to specific, well-fortified targets – through the aid of Russian military aviation. As pointed out by even the Western media, Russian warplanes have carried out over 70 sorties per day at certain points during the Syrian conflict – a number in a single day dwarfing even the wildest accusations leveled against Damascus about chemical weapon use since the conflict began in 2011. There is clearly no tactical, strategic, or political gain for Damascus to use chemical weapons. But there is every reason for the US and its partners to lie and claim it does. The Western narrative – summarized by Stein and O’Brien – also attempts to account for the most obvious explanation for repeated instances of chemical weapon attacks carried out at critical junctures of the conflict, just before major breakthroughs are achieved by Syrian forces – that the attacks are staged to create a pretext for Western military intervention. The regime presumably weighs the expected cost of retaliatory strikes against the clear military benefit of chemical weapons use. The United States, for its part, has to balance the desire to punish the regime for violating its commitment not to use chemical weapons with other factors, like protecting American troops in northeast Syria and limiting the risk of unintended escalation with Russia. The United States and its allies have signaled that they do not want to risk such escalation over the war in Syria. Thus, Assad can count on the presence of Russian forces in Syria to act as a deterrent against strikes that could threaten regime stability. Of course, there are no military benefits for Damascus in using chemical weapons – and of course, the US presence and its multiple strikes on Syrian forces have all been predicated at least in part to allegations of chemical weapon use by Damascus. The US State Department has also repeatedly cited “chemical weapons” as a pretext to maintain a US military presence in Syria. As Syrian forces close in on Idlib, with Western-sponsored militants flushed out of virtually every other city, town, and governorate west of the Euphrates, little will stop Damascus from finally returning security and stability to Idlib as well. Only staged provocations used as a pretext for US forces and their allies to strike at advancing troops or command and control elements of the Syrian armed forces can delay or stop an inevitable victory for Damascus and its allies. With the liberation of Idlib, America’s occupation of eastern Syria will become more tenuous still. 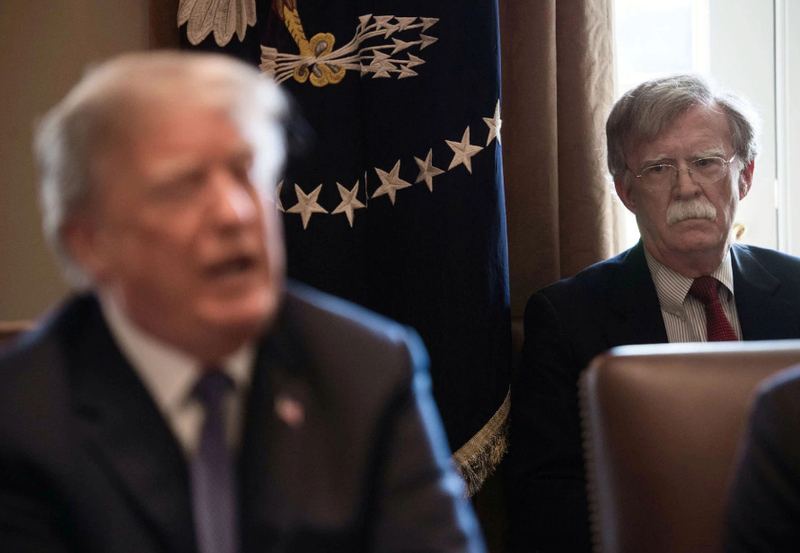 Bolton’s baseless accusations, built on equally baseless, irrational narratives signals a new level of political and diplomatic desperation in Washington, where blatantly staged provocations are done in the open in the hopes the threat of naked force is enough to coerce Syria and its allies to hesitate or withdraw from retaking Idlib. It will be up to Damascus and its allies to ensure sufficient deterrence is put in place to ensure the consequences of America’s use of naked force are greater than any perceived benefits gained from exercising it – tactically, strategically, politically, and diplomatically.